It's that time of year again! 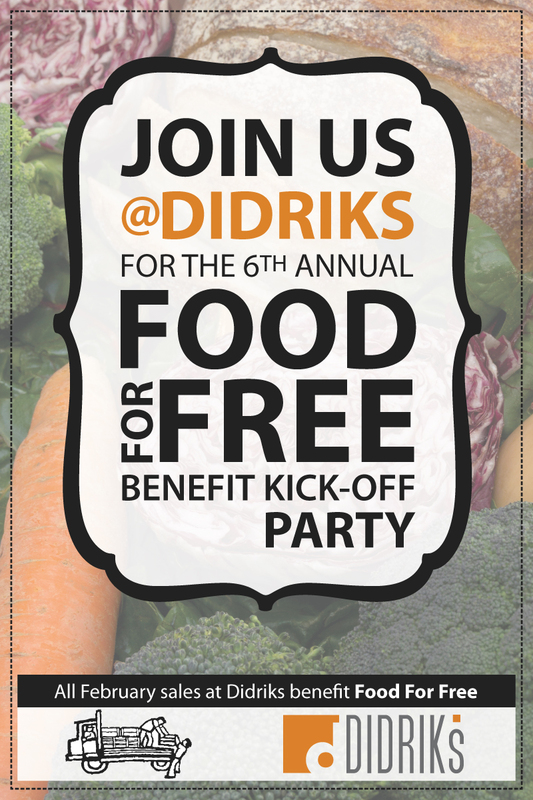 For the 6th year in a row, Didriks will be hosting a month-long campaign to benefit Food For Free, with a kick-off party taking place at our store next week. As we've done in the past, Didriks will donate 5% of all February sales to Food For Free, to aid in their continued efforts to support and assist our local community. This is a great annual event for a fantastic local nonprofit, and we're looking forward to enjoying the festivities again this year. Food For Free is a Cambridge-based non-profit that collects and provides fresh food to the needy in our local community. Their focus is on salvaging healthful foods that might otherwise go to waste, and guaranteeing access to fresh food for emergency food programs. Executive Director Sasha Purpura recently wrote a great post about how partnerships like the one between Didriks and Food For Free so positively impact the community, which you can read here. Next week's campaign kick-off event will be held on Thursday February 6th, from 5-8pm at our retail store on Observatory Hill in Cambridge. Season to Taste Catering will provide the food, and we'll have folks from Food For Free on-hand to chat with visitors! You can RSVP to the event on Facebook, though no formal RSVP is required. We hope to see you on the 6th, but if you are unable to attend the event - stop in or shop online sometime during the month of February to support Food For Free!